FILE - Attendees pass by a Huawei booth during the 2019 CES in Las Vegas, Nevada, U.S. Jan. 9, 2019. A party-backed nationalistic tabloid in China has warned that the extradition battle over tech giant Huawei's chief financial officer, Meng Wanzhou, is likely to be drawn out and complex. In a sharply worded editorial, the Global Times also said Beijing should make it clear that it will retaliate against both Washington and Ottawa if the request is approved. China has already carried out what many see as retaliation against Canada for detaining Meng while she was transiting through the country in early December. Since then, Beijing has arrested two Canadian citizens and recently retried a Canadian facing drug charges, replacing a 15-year verdict with the death sentence. Although the Chinese Foreign Ministry has denied the ruling and cases are connected to Meng, China’s Ambassador to Canada has described the actions as self-defense. The United States is seeking to extradite Meng in connection with the company’s alleged violations of Iran sanctions. On Tuesday, the U.S. Justice Department confirmed it would submit a formal request for Meng’s extradition before the January 30 deadline. After that, Canada has 30 days to review and approve the request. Meng can make appeals and the process could take months, if not years, until she is finally released or handed over to American authorities to face trial in court. It also said that China should prepare for more complicated games. Huawei has long been suspected of violating Iran sanctions, but it wasn’t until recently that U.S. authorities reportedly obtained evidence allegedly linking Meng and others at Huawei to business dealings in Iran. Details of the allegations are likely to become clearer as the extradition process moves ahead. And while China has accused Canada of being a pawn for Washington, arguing that the case is purely political, Prime Minister Justin Trudeau noted at a press conference that Meng will have ample opportunity to defend herself in court. 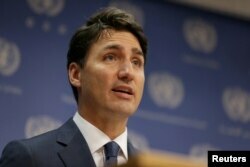 FILE - Canadian Prime Minister, Justin Trudeau, speaks during a news conference at U.N. headquarters during the General Assembly of the United Nations in Manhattan, New York, Sept. 26, 2018. Washington’s request to extradite the company’s CFO comes amid a trade war and as the Chinese company is poised, along with others, to roll out and build the next generation or 5G networks. At a press conference in Beijing Thursday, company leaders unveiled some of Huawei’s newest technologies, including a 5G base station chipset called Tiangang. The company said Tiangang will increase computing power by 1.5 times. None of the company’s heads made any mention of the case against Meng at Thursday’s showcase. Huawei said it has already signed 30 agreements to build up 5G networks, making it a leader in the field. Despite growing concerns about security and the company’s connections to the military and China’s authoritarian party state, Huawei said consumer products saw a record $52 billion in sales last year. Huawei denies the communist led government has any sway over the company and has said it puts its customer’s interests first. Critics, however, find that hard to believe. It is unclear how much financial support the Chinese government has given Huawei. According to an estimate from China’s Center for Information and Industry Development, a government backed research institute, China will spend $170 billion between 2019-2026 on the development of 5G networks. Still, even as the company highlights its progress, a growing number of countries and institutions are pulling the plug on Huawei or banning its equipment from soon to be built 5G networks. On Thursday, a youth charity funded by Britain’s Prince Charles announced that “in light of public concerns,” it would not accept any new donations from Huawei technologies.